Duchess of Cambridge took a fashion forward step in glamorous white dress from polish label to attend an evening cocktail party in Warsaw. The garden party was hosted by the British Ambassador to Poland in the honour of Her Majesty Queen Elizabeth’s 91st birthday. It was an eventful day, for William and Kate, who arrived in Warsaw with Prince George and Princess Charlotte. The royal couple carried out several engagements focused on exploring Poland’s history and supporting young entrepreneurs. At the event, that was hosted at the picturesque Orangery at Lazienki Park, the royal couple was greeted by the President and First Lady of Poland. Tonight we have double reason to celebrate: we mark the birthday of my grandmother the Queen, and we celebrate the depth and breadth of the shared ties of our two great countries. The links between Britain and Poland go back centuries, and are steeped in a rich history of cultural exchange and close commercial relations. 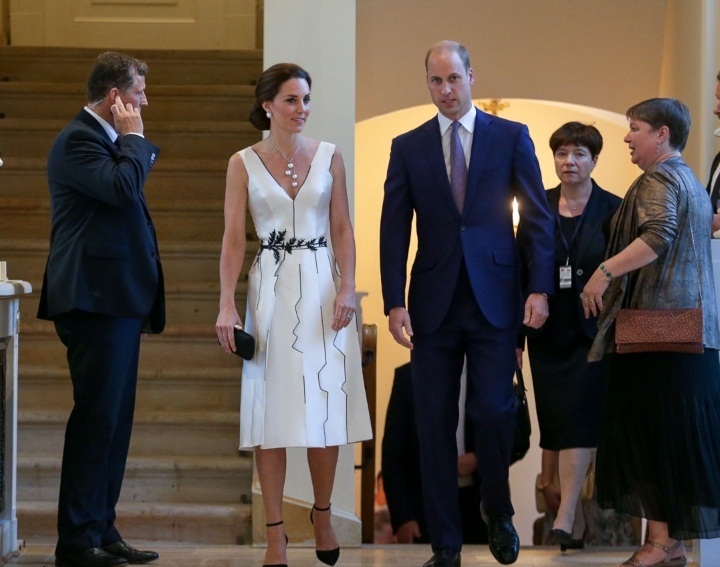 For the event Duchess of Cambridge wore a bespoke piece by Polish designer Gosia Baczyńska. 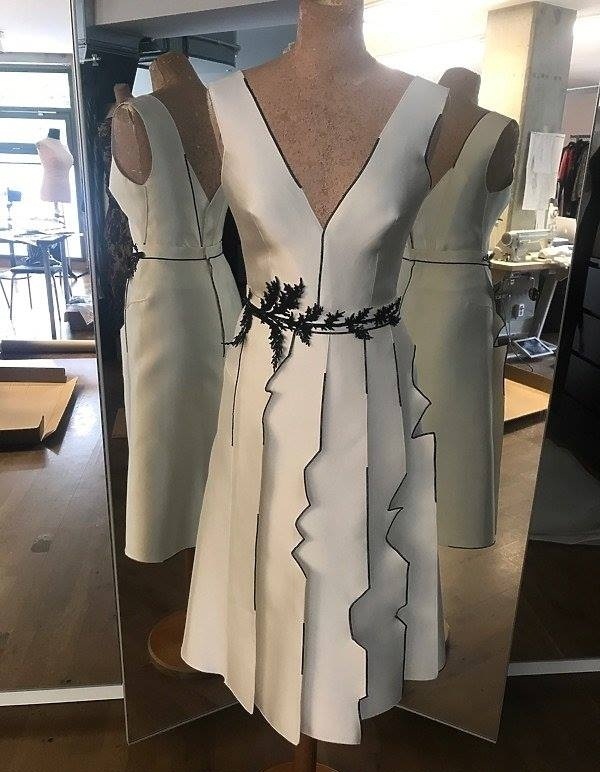 The dress was a white midi-length dress that featured multi-dimensional detailing. The black and white dress features a plunging neckline and leaf embellishment at the waist. The style of the dress was very different from Duchess’ regular wardrobe. Kate’s hair was styled in a gorgeous updo that shows off the matching statement pearl necklace with four large pearls that Duchess wore during Paris visit. Kate wore Gianvito Rossi Ankle Strap Suede d’Orsay pumps that are described as traditional Italian craftsmanship and designs in a d’Orsay silhouette. Softly structured from black suede, the pointed-toe pair is finished with a buckle ankle strap for slender sculpts. Duchess finished her look with black Prada clutch. Tomorrow is another busy day for the royal couple in Poland.